Thousands of New Zealanders generously donated their time, goods and money to support Belgian refugees in the First World War, raising £805,000 (equivalent to about $100 million today) for the Belgian Relief Fund. For their efforts, the Belgian Government awarded some of them with the Queen Elisabeth Medal. Belgium had created the Queen Elisabeth Medal – named after the Queen of Belgium who reigned from 1909 to 1934 – to honour Belgian and foreign women who had performed exceptional services to relieve the suffering of Belgian citizens during the First World War. In New Zealand, 33 women received the medal for their role in fundraising for the Belgian Relief Fund and sending clothing, bedding, and food to Belgians displaced when Germany invaded Belgium. 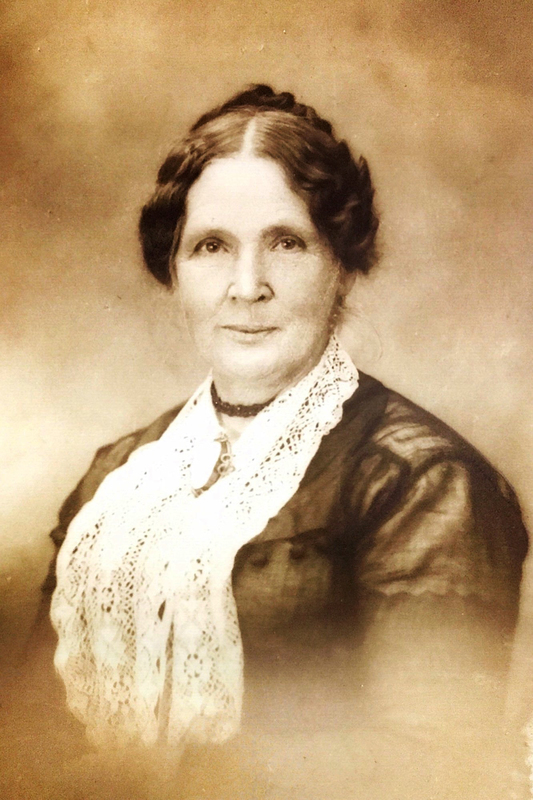 One such recipient was Mrs Elizabeth Pinfold (1859 – 1927), who began supporting causes to help the war effort shortly after the outbreak of war in August 1914. She wrote to newspapers around New Zealand appealing for donations of old clothing for Belgians and Britons in need. The Kaikorai Women’s Association in Dunedin, of which Mrs Pinfold was a member, was soon inundated with donations. In the 1920s, Mrs Pinfold was awarded the Queen Elisabeth Medal for her work fundraising and supporting for the people of Belgium. Mrs Pinfold died in 1927, at the age of 66, from injuries she received after being knocked down by a motorcycle in the main road of Karori, Wellington. A verdict of accidental death was recorded. Mrs Pinfold was buried at Karori Cemetery, in the hills above Wellington. Dilys Grant, Project Manager WW1 Commemorations at the Wellington City Council, discovered Mrs Pinfold’s dilapidated grave at the cemetery, in an unkempt area amongst other old and neglected graves. She worked with the Cemetery Manager, the WW100 Programme Office at the Ministry of Culture and Heritage, and the Belgian Embassy to restore the grave and build a story board sign that would tell interested people about Mrs Pinfold’s story and the work of the Belgian Relief Fund. Elizabeth Pinfold's grave as it appeared before its restoration. A signage company was employed to design and build a permanent sign that could be easily read by passers-by and those visiting the grave. Wellington City Council worked with the Belgian Embassy in Canberra to create a plaque for the grave. The plaque contained an image of the medal, and an acknowledgement from the Belgian Government that the medal had been awarded. Jean-Luc Bodson, the outgoing Belgian Ambassador, who was in New Zealand at the time, attended the unveiling of Mrs Pinfold’s restored grave on 21 July 2017, Belgium’s National Day. 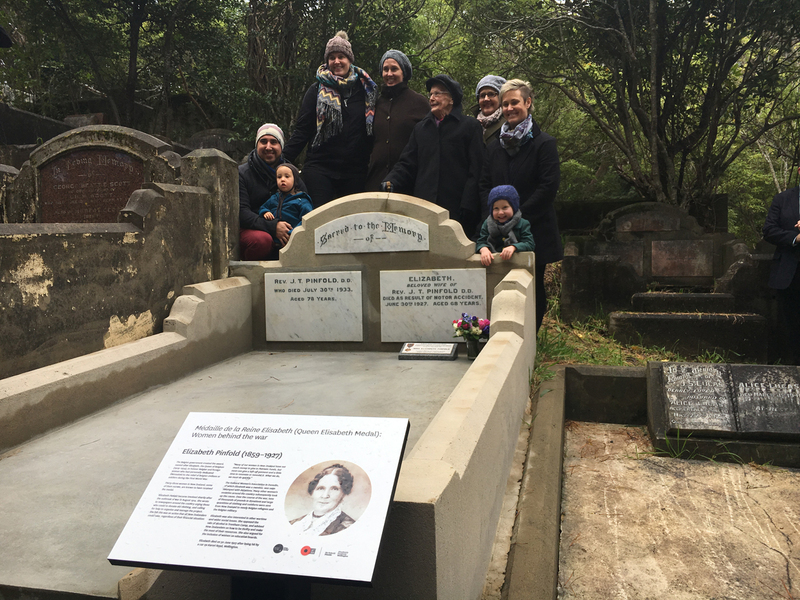 Four generations of Elizabeth Pinfold's descendants gathered to witness the unveiling of their ancestor's restored grave. Also present at the unveiling were Mrs Pinfold’s granddaughter, great-granddaughter, great-great granddaughter, and great-great-great granddaughter. The Dunedin City Council had helped Dilys to trace the four generations of relatives of Mrs Pinfold’s 10 children. Mrs Pinfold’s relatives had been unaware of her achievements and were pleased to be involved in the unveiling and learn about their family history. The Belgian Embassy has completed similar restoration work on the graves of more than 20 women in Dunedin, where most of New Zealand’s medal recipients lived. The unveiling of the restored graves and plaques will take place in mid-October 2017, to coincide with the centenary of the Battle of Passchendaele.